If the Spring Festival has gone,can the prosperity of Amanda be far away? As Chinese traditional holiday just finished, the innumerable foreign merchants is coming to Yiwu,China for products purchasing .At the same time,our company is seeing a continuous wave of clients. Delightfully,on Feb. 20,2014,two more Uruguay clients,Leonardo and Ariel,took a visit to our company and got a warm reception as usual.As the picture says,the person on the right is the general manager of our company while the other two are the clients.Leonardo and Ariel are both underwear dealers and never came to China,but as the same as many other foreign businessmen,they are attracted by the immense potential of Chinese market. So they are here.Though there are thousands of agent companies in Yiwu,they finally chose Amanda.Because they were completely moved by our deep sincerity and considerate service.After viewing our showroom and warehouse,they were totally stonished and fairly satisfied.Meanwhile they constantly commended that we are NO.1 agent in Yiwu and our boss is pretty brilliant and far-sighted.Time will prove that they made a wise choice indeed. With these superior customers and the joint efforts of all staff,Amanda firmly belive that we can be worthy of the name of NO.1 Agent and will wholeheartedly provide more professional and thoughtful services for businessmen all around the world. 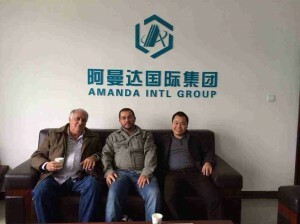 Welcome to Yiwu China.Welcome to Amanda.